USS Simon Lake was named for Simon Lake (1866 - 1945), a naval architect, inventor and builder of an early submarine, Argonaut Junior, for the US Navy in 1894. After a shakedown cruise to Pearl Harbor, HI in early 1965, USS Simon Lake transisted the Panama Canal in April 1965 and moved to her first homeport, Charleston, SC. There for the next two years she provided material support and technical expertise to the Atlantic US Submarine Fleet. In July 1966 Simon Lake sailed to her new station, Holy Loch, Scotland. In Holy Loch for nearly fours years, Simon Lake supported Submarine Squadron 14. In May 1970 she returned to Charleston, then on to Bermerton, WA for Overhaul and conversion to support Poseidon Missile Submarines. Exiting the shipyard in March 1971, Simon Lake returned to Charleston in April and went back about the business of submarine tending there until departing for Rota, Spain in November 1972. After spending five years in Rota, Simon Lake returned to Charleston NSY in January 1977 for overhaul. 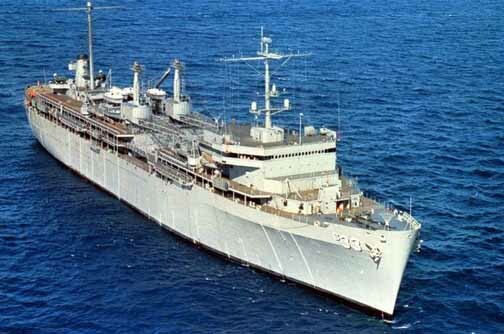 During the late 1970's USS Simon Lake remained on the East Coast of the United States porting at various times in Guantanamo Bay, Cuba; Kings Bay, GA; and Goose Creek/Charleston, SC. USS Simon Lake returned to Holy Loch, Scotland in May 1987. With the fall of the Berlin wall and decline of the Soviet threat, Holy Loch was no longer needed. Simon Lake sailed in March 1992 for Norfolk, Va, ending the US presence at Holy Lock. After being overhauled from March 1992 to March 1993, Simon Lake sailed for La Maddalena, her homeport for the next six years. She transited the Suez Canal and Red Sea in March 1998 to support of Operation Southern Watch in the Persian Gulf. In June 1998, she returned to La Maddalena, Italy. She continued living up to her motto, RESULTS NOT EXCUSES over the next year until departing for Norfolk, VA.
JAN 1981 - AUG 1985 Kings Bay GA.
Simon Lake (AS-33) was laid down on 7 January 1963 by the Puget Sound Naval Shipyard, Bremerton, Wash.; launched on 8 February 1964; sponsored by Mrs. Cecil Ford and Mrs. Herbert Diamond; and commissioned on 7 November 1964, Capt. James B. Osborn in command. Simon Lake sailed from Bremerton on 16 January 1965 for Pearl Harbor on her shakedown cruise and returned to Bremerton on 17 February for a six-week yard availability period. The Polaris submarine tender stood out of Bremerton on 16 April and proceeded to Charleston, S.C., via the Panama Canal. Simon Lake arrived at Charleston on 1 May and tended submarines there until 11 July 1966. On that date, she sailed for Holy Loch, Scotland, where she relieved Hunley (AS-31) as tender for Submarine Squadron (SubRon) 14. She operated from there until 24 May 1970 when she got underway for Charleston. In June, she sailed for Bremerton for her first overhaul since commissioning. The tender was in the yard from6 July 1970 to March 1971 and, while there, was also converted to Poseidon missile capability. Simon Lake returned to Charleston on 3 April and tended submarines there until 19 November 1972 when she sailed for Rota, Spain, as the relief for Holland (AS-32). Into September 1974, Simon Lake is still operating from Rota.